Do you enjoy art, music and dance or have an interest in writing, producing films and taking photos? Then join us and have fun unleashing your inner artist with PTA Reflections! This year’s theme, “Heroes Around Me,” calls for your own unique interpretation through the arts. Download submission guidelines and entry forms below and submit your work by November 5. For inspiration, visit the Reflections virtual art gallery and learn more about prizes and scholarships at PTA.org/Reflections. 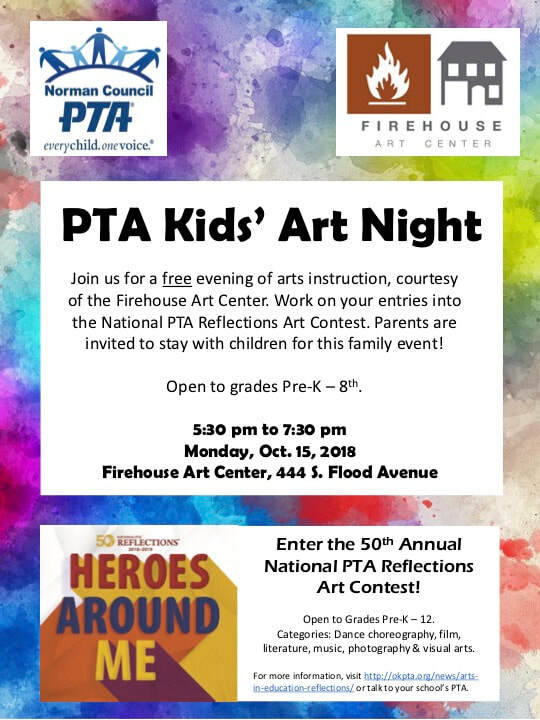 Don't miss the FREE student art event on October 15 at the Firehouse Art Center. See details below!